Cheong Wa Dae on Thursday revealed the final part of the government’s constitutional amendment bill that seeks to introduce a presidential system that allows two consecutive four-year terms. In addition, the proposed bill includes measures to distribute the power of the president and lower the voting age. Cho Kuk, senior presidential secretary for civil affairs, also stressed that President Moon Jae-in would not be subject to the changed law if it is amended according to the government’s proposal. Citing Article 128 of the Constitution, he said President Moon would not be allowed to run for re-election after his single term ends in May 2022. “The current five-year single term presidency was chosen in the last constitutional revision in 1987 following a long dictatorship,” Cho said during a press meeting. In the third and the last presentation of the government’s proposal for constitutional amendment, Cho also revealed plans to distribute presidential power and reform the election and judicial system. The government plans to submit its proposal to the National Assembly on Monday. According to Cho, polls have shown the presidential system to be the most favored government structure despite criticism that too much power is vested in the president. The government proposes deleting phrases in the Constitution that it deems to depict the president as an “imperial” figure. Such expressions include “head of state” in Article 66 of the Constitution, which states that the president is the “head of state” and represents the state vis-a-vis foreign states. Under the proposed changes, the phrase “under the orders of the president” used in reference to the duty of a prime minister would also be deleted to strengthen the authority of the prime minister’s office. 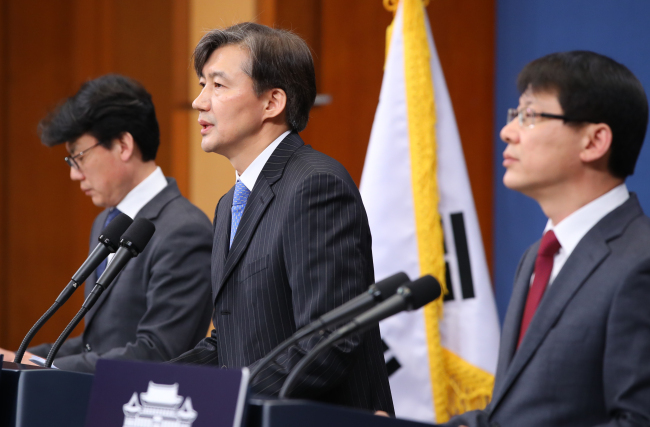 Under Moon’s amendment plan, presidential pardons would have to be reviewed by an independent pardoning committee, and the Board of Audit and Inspection would be separated from the presidential office as an independent entity, Cho said. The right to appoint the chief justice of the Constitutional Court would be given to the justices so they can name their own chief. The National Assembly would also be given more power under the government’s proposal, with more legislative and budget oversight rights, Cho explained. For the government to table a bill, it would need approval from at least 10 lawmakers, and the parliament would have the right to appoint three members of the nine-member Board of Audit and Inspection, which is entirely chosen by the president now. But the proposed plan rejected the opposition parties’ calls to allow the National Assembly to appoint or recommend the prime minister, as it would not be different from a parliamentary cabinet system. Cho also referred to local polls that showed the most preferred government structure is the presidential system, and that many had opposed the idea of the parliament appointing the prime minister. Moon’s proposal also urged the election law to be changed from the current single member constituency system to be more balanced to ensure each voter exercises more equal voting rights. “The current system leads to excessive invalid ballots votes. The number of ballots cast for a party is not fairly represented by the number of parliamentary seats the party wins at the National Assembly,” Cho said. He said the presidential office would insert a new phrase, “the distribution of parliamentary seats should be proportional to the intent of the voters,” and urged the lawmakers to revise the election law. The proposal also seeks to lower the voting age by a year to 18. Cheong Wa Dae revealed elements of the bill concerning basic rights and decentralization on Tuesday and Wednesday, respectively.